Home UX/UI Design Experience Design: a new discipline? A critical review and reflection on its practice, written as part of my Masters in Digital Experience Design at Hyper Island (2018). After the superficial and consumerist culture of the eighties and nineties, our Western societies have known a fundamental shift from the material to the experiential. People care more about living experiences than owning things which can be explained as studies show that experiential purchases make people happier than material purchases of the same value (Boven and Gilovich, 2003; Carter and Gilovich, 2010). This shift in how people spend their money indicates a post-consumerist society and an increasing interest in personal improvement. At the same time, we also witness a shift from technology-driven innovation to social and human-driven innovation. This post-materialistic society has profoundly impacted the core of the global business offerings, placing experiences as a distinct form of economic output (Pine and Gilmore, 2014). In the experience economy, businesses need to rethink how they create value for their customers to succeed. “Experience Design” or “User Experience Design” emerged as a discipline in the broader field of design in response to this quest for new customer value. Unfortunately, the intangible nature of experiences makes it difficult for industries to understand what it entails to design products or services with the experience in mind. Therefore, experiences are often considered as nothing more than a vehicle for marketing and not as the very product that is sold (Hassenzahl, n.d.). As a logical consequence to the confusion around what is an experience, the practice of the discipline is also very ill-defined and often confused with other related fields of design, such as User Interface Design, Service Design or Product Design. This paper is a critical review of the emerging field of Experience Design from theory to practice. It starts by exploring the many definitions of what practitioners mean by experiences and experience design and the complex interplay with other relevant fields. Then, it outlines the design process and scrutinises the tools and techniques used to solve design problems from personal practice at Hyper Island. It concludes with ethical considerations surrounding the discipline and proposes some recommendations on how to contribute to its evolution. 1.1. What is an experience? To understand what is experience design as a discipline, we first need to understand what practitioners mean when they talk about experiences. Experiences or user experiences are often understood as what people think and feel moment-by-moment when interacting with a product like the iPhone for example. It is about the aesthetic of interaction between a user and a device, and, in this case, the focus is still very much on the product, and the experience happens only in the applications, not with the device. Another view supported by Marc Hassenzahl is to consider experience as a memorised story of use or consumption emerging from how a user makes sense of the world, a transformation onboarding the user in a story that will change the way he lives. He uses the example of a wake-up light that simulates sunrise and birds noise to positively influence the user behaviour when waking up in the morning. In that case, the product “transcends its encasing”: the focus is the experience, and the product becomes secondary (Hassenzahl, n.d.). Therefore, for Hassenzahl, “Experience or User Experience is not about technology, industrial design, or interfaces, it is about creating a meaningful experience through a device.” While agreeing with this definition claiming that the aesthetic of interaction and experience are two different things, Eric Reiss believes that experience is not necessarily through a device, which brings us to the heart of the debate between experience and user experience (Reiss, n.d.). While the term User Experience comes from the usability community, the term Experience can be broader including services, processes or any system that a person can go through whatever there is a device used or not in the user journey. Consider for instance a cat cafe where customers pay an admission fee to sit for half an hour surrounding by cats while drinking coffee. The experience here does not involve any device and place the experience of sitting with cats at the fore while the original service of a cafe to serve beverages is secondary. Therefore, if limited to a device, User Experience should be considered as a subcategory of Experience. J. Pine and J. Gilmore’s definition of experience supports Hassenzahl’s view as they define experiences as commercial offerings that engage customers in memorable ways and a distinct form of economic output where customers pay for the experience itself. 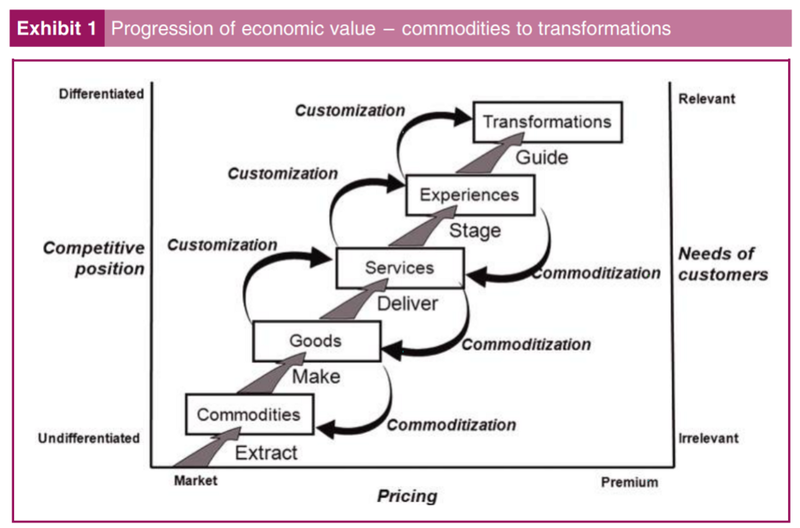 They defined experiences through the lens of economic value and identified mass customisation as the critical driver in the progression of commodities. Therefore, their very logical view defines experiences as enhanced services and transformations as the result of guided experiences (Pine and Gilmore, 2014). 1.2. What is Experience Design? Considering the broader view of experiences as meaningful stories encapsulated in a product or service transforming how users live, what does it entail to design experiences? For Hassenzahl, designing experiences happen before designing the product as the encasing is secondary. It means that experience designers need to care more about the ‘why’ of product use, in contrast with usability which still very much focus on the ‘how’, the aesthetic of interaction including the technology used. While usability is about making a product easier for the user, experience design is about questioning the model behind, thinking first about what is the desired impact on people, focusing on the consequences of using a product and how they can be influenced (Hassenzahl, n.d.). Reiss defined User Experience design as “the conscious act of coordinating interactions that are controllable, acknowledging interactions that are beyond our control and reducing negative interactions” (Reiss, n.d.). It means that designers cannot fully control the user experience, but they are nevertheless responsible for orchestrating a complex series of interactions including the emotional and physical responses that these interactions generate. Considering Reiss’s definition stressing that experiences are not necessarily through a device, it suggests that this series of interactions can happen both in the digital and physical world. For Whitney Hess, “experience design is about alleviating people’s problems and bringing them joy” through products, services and systems that should improve the quality of their lives, reduce stress, and create efficiencies that did not previously exist (Hess, n.d.). It means that at the core of experience design is the understanding of people’s needs and the will to improve their lives. As the experience design discipline is still emerging and can embrace different definitions depending if it is about designing products or services through a device or not, its design process has not a clear roadmap. It is more of a mishmash of different processes that practitioners select and use according to the challenges they face. Matt Kendall, Creative Director at Retrofuzz, a digital creative agency in Manchester, defined during a talk at Hyper Island on 21 May 2018, that the experience design process is made of a mix of Design Thinking, Lean and Agile methodologies. According to Kendall, Design Thinking is good at exploring the problem, while Lean is about building the right thing and Agile about building the thing right (Kendall, 2018). What all these methodologies have in common is that they are people-centric, non-linear and iterative, which means that they have a human-centred approach to design and uses rapid prototyping to test solutions with real users and iterate until reaching the desired outcome for people. In my opinion, Lean and Agile are more project management methodologies than a guide for the design process. Even if Design Thinking terminology does not reflect the full spectrum of its practice as “doing” takes a considerable part of its process, it already covers the three components that Kendall highlighted. As defined by the Design Council and its visual framework called the Double Diamond, the first diamond represents the problem space while the second diamond serves the solution space (Design Council, n.d.). It means that “framing the right problem is the only way to create the right solution” (Hasso Plattner, n.d.). The Design Thinking methodology allows practitioners to explore the problem space to frame the right problem to solve before exploring the solution space to build the right thing in the right way. What is also important to highlight in the Design Thinking process represented by the diamond shape is the two ways of thinking used by designers: divergent thinking to create choices and convergent thinking to make decisions (Brown, 2009, p.67). These two modes of thinking are used both for defining the problem and the solution. It is what Tim Brown means by “thinking like a designer”, the ability to jump back and force between these two modes at the right moment and Kelley stresses that it can only be done by teams of diverse people (TheRosePedals, 2013). Although diversity in teams allows people to build on each other idea and prevents the phenomenon of groupthink, it only works when the right culture is in place. Through working in many different teams of people from different backgrounds, cultures and ways of thinking at Hyper Island, one essential learning is that diversity requires empathy for the people you work with, and this is the only way for designers to build deep empathy for the people they design for, a key mindset to design meaningful experiences. Whatever the different methodologies of Design Thinking developed by Ideo, the d.school or the Design Council, it all starts by empathising with the people we are designing for to understand their needs and uncover deep insights that will drive designers to focus on the right problem to solve. -’Discover’ is the research phase where designers try to freshly look at the world, empathise with their users to gather insights. -’Define’ represents the synthesis phase where designers try to make sense of all the information gathered to uncover core insights that will enable the craft of a meaningful and actionable problem statement bringing clarity and focus to the following design space. -’Develop’ opens up the ideation phase where designers generate lots of ideas, create concepts, and evaluate them. -’Delivery’ is the implementation phase where designers build prototypes to test with their users and learn from them to iterate until they reach the desired outcome. 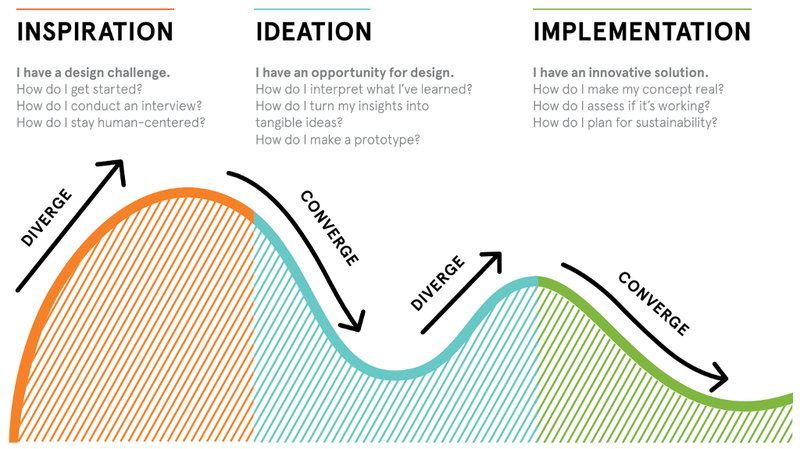 Although non-linear, each phase has its set of tools and techniques that help experience designers feel comfortable wading into the messy complexity of going through the design process of creating something new for the world. To truly understand the experience design discipline, a focus on the tools and techniques used during the process is presented through case studies from practice at Hyper Island. 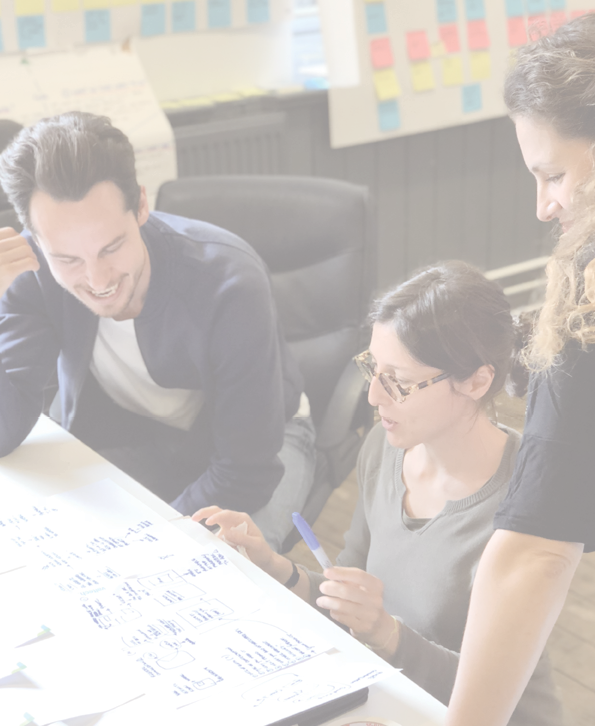 During the research phase, experience designers lead primary and secondary research, also known as design research, to understand the needs, motivations and behaviours of the people they design for and the particular context of the project. Erica Hall stresses that designers should approach familiar people and things as though they are unknown to them to see them clearly (Hall, 2013, p.6). It means that designers should adopt a beginner mindset and remember that they are not their users. Desk research, also called secondary research, is a good starting point of a research process as it helps designers understand the context and give a direction for the primary research. It can be both qualitative and quantitative and aims to learn about an industry, an organisation, competitors, similar products or services, market research report, trend analyses, studies from trusted sources (Stickdorn et al., 2018, p.8). Interviews constitute the crux of human-centred design as “there is no better way to understand the hopes, desires and aspirations of those you are designing for than by talking to them directly” (Ideo, 2015, p.39). Ideo also stresses the importance to talk to the right people which means a broad spectrum covering both mainstream and those on either extreme but also finding the right balance of experts and laymen, women and men, people of different ages and ethnicities (IDEO, 2015, p.36, p.49). For helping the BBC understand the needs of future audiences regarding live sports broadcasting, the team conducted six in-depth interviews with five extreme users and one with an expert. The team interviewed a newbie who only watched live sports for the Olympics, and, in contrast, men who followed multiple major sports leagues every week. Extreme user interviews yielded valuable insights on what makes watching live sports a good or bad experience depending on their interests. However, interviewing people requires practice to get more profound insights and are better done with two people, one asking questions and one taking notes, which helps to focus on the interviewee and build rapport with him. Another point is to preferably do interviews in the context of the interviewee as it allows more observations of the person in his environment which was lacking as most interviews were conducted on Skype. Surveys are a great addition to interviews as they allow to collect vast amounts of data about the users quickly. However, preparing a great survey is challenging as writing good questions takes time, and “surveys are useless until you know who it is for and what you want to learn from it” (Thelwell, 2015). 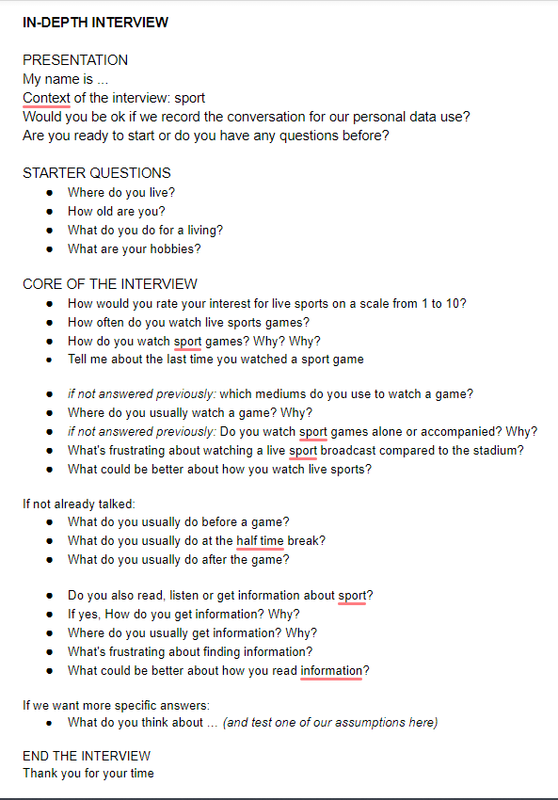 When starting research for the BBC, the team surveyed sports fans to understand their preferences and habits when watching live sports. 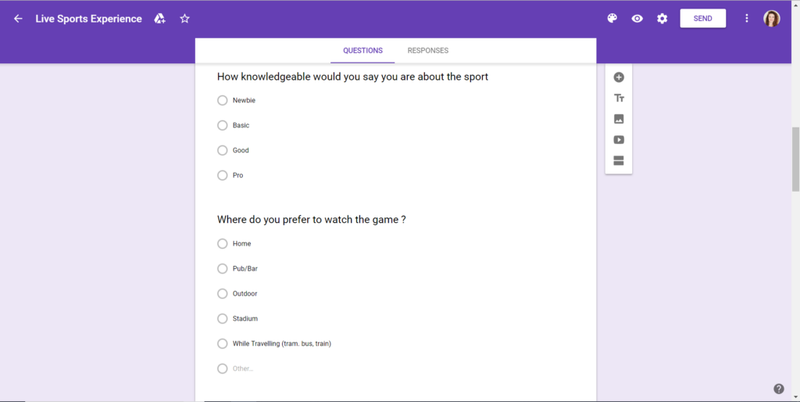 The survey encompassed sixteen questions realised on Google form, an application allowing to quickly create a survey that can be shared through a link to participants. It was sent on a couple of teammates’ Facebook pages and yielded about fifty answers in just two days. It revealed that people if given a choice, prefer to watch live games at the stadium with their friends, but most of the time they watch it at home alone which led to reframe the design challenge for people watching sports at home alone. However, uncovering this insight took the team much time as there were too many questions and no explicit hypotheses we needed to validate when preparing the questions. Using the Lean Survey Canvas would have brought a better focus and clarity on what we needed to learn (Thelwell, 2015). Screenshot of the survey created by team Trampoline for the BBC brief at Hyper Island (2018). During the definition phase, experience designers attempt to make sense of all the data gathered to uncover opportunities for design. A persona is a tool for synthesising user research by creating a fictional character representing a group of real consumers with similar characteristics and needs (Pruitt & Adlin, 2006; Turner & Turner, 2010). By bringing to life the target customers, it helps the product design team to put their needs and goals in the centre of the design process. Personas also help to narrow the target audience; instead of designing for everyone, designers can design for the persona(s), which will increase the likelihood of product success (Miaskiewicz and Kozar, 2011). The two personas created by team Pandas for the Well brief at Hyper Island (2018). Working for Well Pharmacy, research was conducted to define who were the consumers of emergency contraception to design a new service for delivering EllaOne, an emergency contraception pill. After debating on how many personas were necessary and what were their differences, the team created two using an empathy map, a tool to create personas based upon their goals, needs, behaviours, thoughts and feelings (Gray, 2017). One was a young woman who needed the pill for the first time and was overwhelmed by the situation seeking guidance from her close friends on what to do. The second was an older woman who already took the pill, stressed by the situation but who was more looking for convenience in the buying process and information about potential side effects than support in the decision making. Personas were useful to align the team on the needs of these two women. However, knowing how to segment them was unclear as it requires to know already what we were trying to achieve which should have been informed by the client. Behavioural archetypes, presented by R. Cervetto and R. Doneva, from Common Good, during a workshop at Hyper Island on 31st May 2018, offer a method for segmenting personas based on role — what they do differently-, ability -how they do it differently- or motivation -different reasons why they do it- (Cervetto and Doneva, 2018). 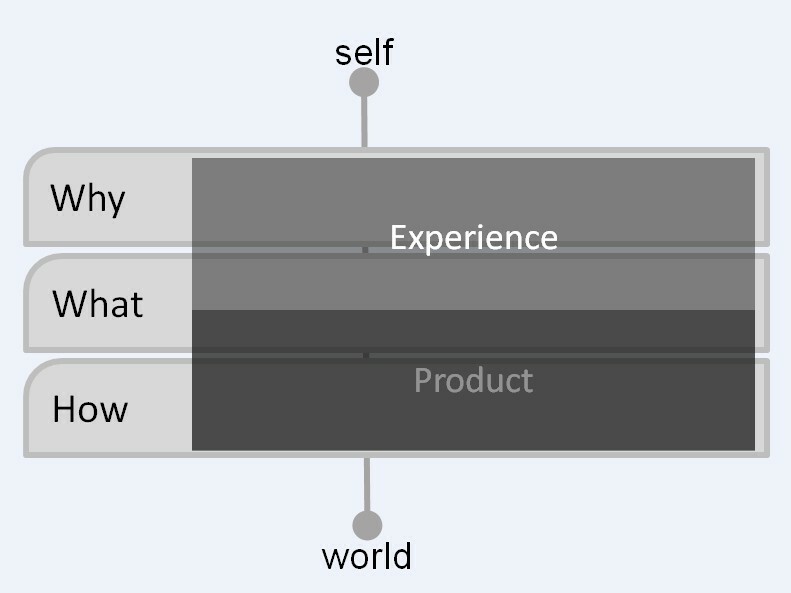 An experience map is a tool illustrating an actual or future persona’s journey within a given domain by focusing on the broader context of human activity. In contrast, customer journey maps which are very similar, tend to view the individual as a consumer of a product or service and analyse his relationship with the offering of an organisation. As service ecosystem become more complex and standalone offering is no longer standard practice, organisations use experience maps to look how they can design their offering to fit a person’s experience, and not the other way around (Kalbach, 2016, p.273–280). 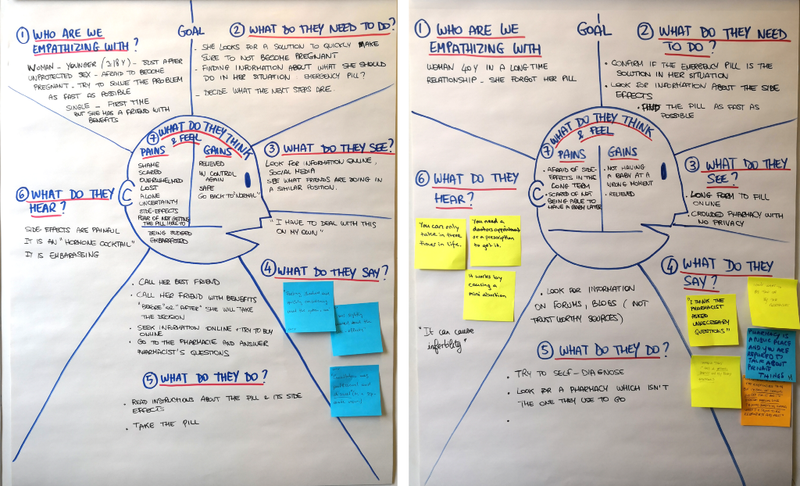 After building personas for Well, the team needed to understand the different stages they went through when they were in need of emergency contraception. As there were two personas, two experience maps were created including their actions, the channels used, their thinking and feelings. Their analysis allowed to uncover opportunity areas. While both felt anxious, overwhelmed and feared judgement from pharmacists, the main difference was the need to find information and talk or not to someone during the decision-making process, which informed the design of the solution by providing two ways of buying the pill. Mapping the experience was a valuable technique but would have been more accurate if co-created with users. Synthesis, in human-centred design, is a collaborative process of sensemaking, which leads to creating a coherent summary of all the data gathered during the design research (Cooper-Wright, 2015). 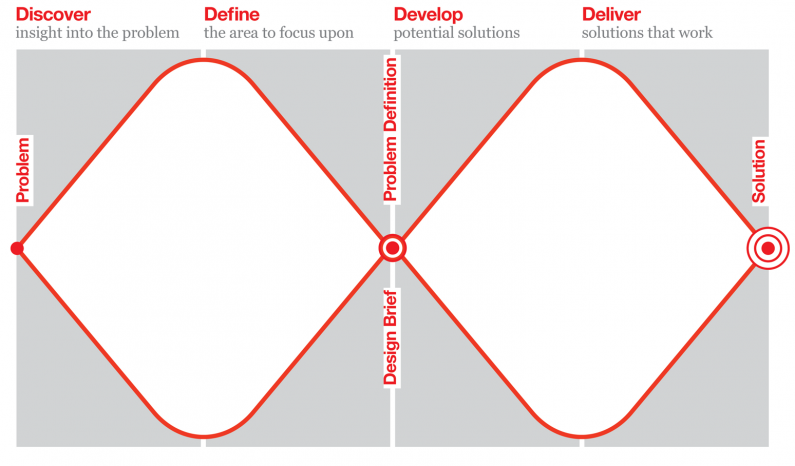 The process encompasses a series of techniques that teams accomplish together to reach consensus on the reframing of a design challenge (Ideo, 2015). The ideation phase is about generating many ideas based on the reframed challenge. Experience designers use divergent thinking and build on each other ideas to push creativity and reach innovative solutions. They use a series of individual and collective techniques to sketch ideas, develop concepts and evaluate them. As Google found, “the most innovative ideas are often produced by individuals in concentrated thought” (Google, n.d.). Crazy 8’s is a fast sketching exercise that challenges people to sketch eight ideas in eight minutes. The goal is to push beyond first ideas which are frequently not the most innovative and generate a wide variety of solutions to the design challenge (Google, n.d.). For the BBC, the team did three rounds of Crazy 8’s to create a pool of inspiration for the three opportunity areas previously defined. Although Crazy 8’s is done together as a team and can be intimidating for the most introvert people, it is an individual ideation method that yielded excellent results. As the aim is to give space to the more creative impulses when weird and impractical ideas are welcome, this was a fun moment for the team which sparked inspiration when team members shared their crazy ideas and naturally started to ask to build on each other ideas. One idea generated gave birth to the final concept: user-generated content as object-based media to allow sports fan to broadcast their amateur commentary of the game. It is a technique for ranking ideas and choosing the best ones (Gray, 2010). As defined by Liam Viney and Adrian Teague during a talk at Hyper Island on March 20th, “prototypes are a means to explore ideas, test, and tell stories” (Viney and Teague, 2018). Prototyping helps experience designers bring their ideas to life as quickly as possible by turning abstract concepts into something tangible. “If a picture is worth 1000 words, a prototype is worth 1000 meetings” meaning showing a prototype is better than explaining (Kelley and Kelley, cited in interaction-design, n.d.). Prototypes can be done not only in the delivery stage but throughout the entire design process. They can provide a different way of researching, help communicate ideas across the team, test assumptions and find out if it is what people need, in short, it helps generate, share, test and improve ideas (Kendall, 2018). Experience designers have many ways to build prototypes from low to high fidelity and adapt their techniques depending if they design a new product, service, space, system or business. The choice of level of fidelity should consider the audience (who), information (what) and goal (why) (Viney and Teague, 2018). The ultimate goal of prototyping in human-centred design is to test ideas early with real users to get feedback and refine them until they truly meet the user’s needs. They include rough sketches, paper prototypes of digital interfaces, storyboards, models, role plays and business model canvas. They have the advantage of being inexpensive, quick to build and collaborative, but does not give a realistic feel, lack fine details and interactions. 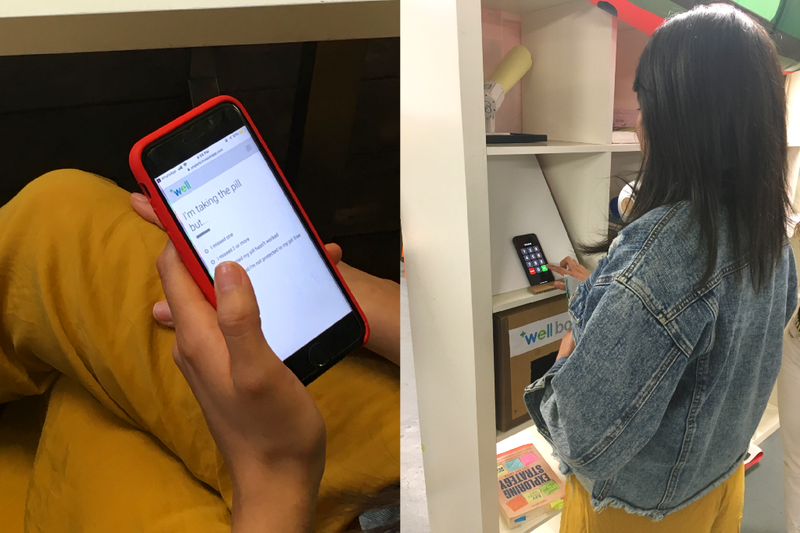 For Well, the team built paper prototypes to design high-level wireframes and a model of a pickup box for a new 24/24 and 7/7 delivery service to buy emergency contraception and other pharmacy products. 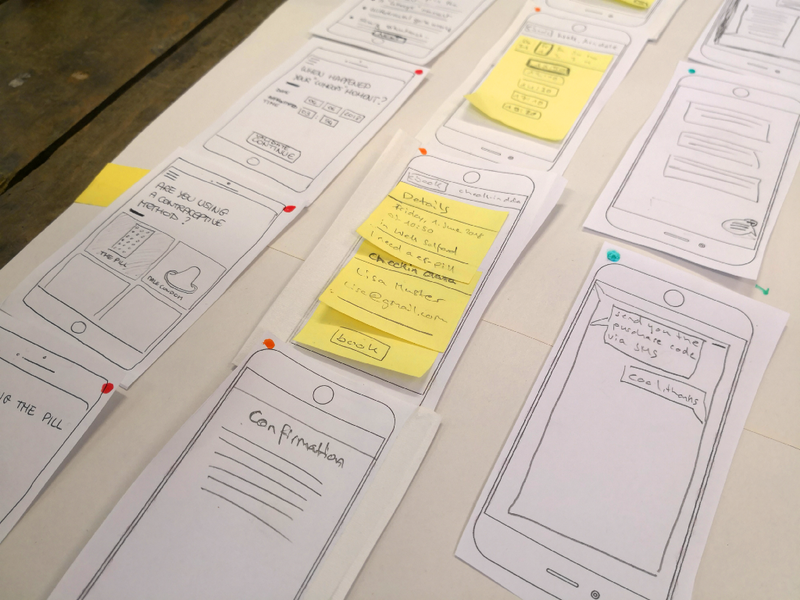 Low-fidelity prototypes helped clarify how concepts would work throughout the journey across digital and physical touchpoints and communicate ideas more clearly. It was also a useful way to give feedback on each other work and, as they are less precious, it was easier for team members to receive them. However, writing solution hypothesis would have helped clarify the goal of each concept, and testing with users, test many assumptions we had at this stage. Oftenly wireframe clickthroughs for digital products, they are slightly more detailed, still rough but closer to the solution. They give a better sense of what the solution might look like and are great for refining its execution while still providing room for changing direction and testing out options (interaction-design, n.d.). For Well, paper prototypes of the digital interface were turned into a digital prototype in InVision, a collaborative tool to create clickable prototypes that can be shared for testing. The first round of tests with users provided feedback about the concept itself. The solution offered four ways of buying the pill with different levels of human interaction. Taking an appointment in a pharmacy, the more face-to-face way, was dropped as no user picked it. However, this could have been discovered before if tested earlier. They are usually digital prototypes such as facades, mockups and motion studies. They are more specific and descriptive but the more high fidelity they are, the more costly, rigid and skill dependent they become. They are the last line of testing before moving on to the execution of solutions. After the first round of testing, a polished version of the web app for Well was made using Sketch and InVision to convey a real feel of the product. When testing the tone of voice, feedback made the team realise that adopting a too friendly writing style to try to reassure the user was perceived as not professional and not what users would expect from a pharmacy. It helped refine the solution before presenting it to the client. However, the solution could have benefited from more testing with extreme users to reveal some security problems like the pickup code in a notification which should have been more secure in an email. If designing experiences is about designing for the consequences of a design, designers should be mindful of what kind of changes they want for the users. Empathy helps experience designers understand their users; it should also help them design solutions that not only meet users’ needs but also “ensure users their right of choice” and “invoke positive behaviour changes” (Tollady, 2016). It stresses the big responsibility and power designers have in how they shape their solutions and implies that they should know what would be a positive change for the people they design for. Not being aware of it could lead experience designers to create solutions that impact negatively people’s decision and, as a consequence, the way a society behaves. Sometimes, it might just be a lack of awareness but some evil design practices, known as dark patterns, clearly intend to manipulate people. Dark patterns use knowledge of cognitive science and human behaviours to achieve goals like increasing sales or improving numbers of sign-ups placing business needs far above the ones of the user (Tollady, 2016). Even if human-centred designers must also ensure the feasibility and viability of solutions for a business, they first need to create positive value for a user’s experience. Learning the principles of behavioural economics which explores human behaviour only through the lens of decision-making could help experience designers learn how to nudge users for positive behaviour change. However, ethical frameworks are needed to ensure a good practice of experience design. Designing a new delivery service for an emergency pill was the occasion to explore ethical issues around what should be the right level of its accessibility. The team saw the opportunity to educate the audience on alternative solutions like the copper coil which could be a better solution for women who already took the emergency pill several times because of missing to take her regular contraceptive pill. Considering that the client was only selling this pill and not other emergency contraception, finding an ethical way of selling the pill was tricky. After a few iterations, the solution included alternative options not sold by Well but presented with the same importance and with some help to buy it in case it was what the user prefers. As services and products are intertwined through a series of physical and digital interactions, experience designers seem to be the maestro of this new symphony, striving to create coherent and meaningful stories for people. Experience Design is not a new design discipline per se but rather a new mindset resulting from the shift from technology-driven innovation to social and human-driven innovation. Experience designers are empathic product and service designers who think about the consequences of their design before crafting experiences that will positively impact people’s lives. In a way, they are “design activists” of the new world. Boven, L.V., Gilovich, T.D. (2003) To Do or to Have? That Is the Question. Journal of Personality and Social Psychology. 85 (6), 1193–1202. Carter, T.J., Gilovich, T.D. (2010) The Relative Relativity of Material and Experiential Purchases. Journal of Personality and Social Psychology. 98, 146–159. Hassenzahl, M. (n.d.) User Experience and Experience Design. In: Soegaard, M., Dam, R.F. (eds). The Encyclopedia of Human-Computer Interaction. 2nd Ed. [Online] The Interaction Design Foundation. Accessible at: https://www.interaction-design.org/literature/book/the-encyclopedia-of-human-computer-interaction-2nd-ed/user-experience-and-experience-design?r=bayle-marion [Accessed 2nd June 2018]. Hess, W. (n.d.) User Experience and Experience Design. In: Soegaard, M., Dam, R.F. (eds). The Encyclopedia of Human-Computer Interaction. 2nd Ed. [Online] The Interaction Design Foundation. Accessible at: https://www.interaction-design.org/literature/book/the-encyclopedia-of-human-computer-interaction-2nd-ed/user-experience-and-experience-design?r=bayle-marion [Accessed 3rd June 2018]. Miaskiewicz, T. & Kozar, K., A. (2011) Personas and user-centered design: How can personas benefit product design processes? Design Studies. 32. 417–430. Available at: http://doi:10.1016/j.destud.2011.03.003 [Accessed 10th july 2018]. Pine, J.B., Gilmore, J.H. (2014) A leader’s guide to innovation in the experience economy. Strategy & Leadership. [Online] 42 (1), 24–29. Available at: https://doi.org/10.1108/SL-09-2013-0073 [Accessed 2nd June 2018]. Pruitt, J., & Adlin, T. (2006). The persona lifecycle: Keeping people in mind throughout product design. San Francisco: Morgan Kaufmann. Reiss, E. (n.d.) User Experience and Experience Design. In: Soegaard, M., Dam, R.F. (eds). The Encyclopedia of Human-Computer Interaction. 2nd Ed. [Online] The Interaction Design Foundation. Accessible at: https://www.interaction-design.org/literature/book/the-encyclopedia-of-human-computer-interaction-2nd-ed/user-experience-and-experience-design?r=bayle-marion [Accessed 3rd June 2018]. Turner, P., & Turner, S. (2010). Is stereotyping inevitable when designing with personas? Design Studies 1–15. Brown, T. (2009) Change by Design: How design thinking can transform organiza­tions and inspire innovation. New York: Harpercollins Publishers. Hall, E. (2013) Just enough research. New York: A Book Apart. Hasso Plattner (n.d.) The Bootcamp Bootleg. [Online] d.school. Available at: https://dschool.stanford.edu/resources/the-bootcamp-bootleg [Accessed 8th July 2018]. Ideo (2015) The Field Guide to Human-Centered Design (1st ed.). [Online] Ideo.org. Available at: http://www.designkit.org/resources/1 [Accessed 7th July 2018]. https://www.interaction-design.org/courses/design-thinking-the-beginner-s-guide/lessons/6.4 [Accessed 12th July 2018]. Kalbach, J. (2016) Mapping Experiences, a complete guide to creating value through journeys, blueprints & diagrams. Canada: O’Reilly. Kelley, T. & Kelley, D. (n.d.) Daily design quote. [Online] Interaction Design Foundation. Available at: https://www.interaction-design.org/quote/show/tom-david-kelley?utm_source=daily-quote&utm_medium=email [Accessed 11th July 2018]. Stickdorn et al. (2018) This is service design doing. New York: O’Reilly Media. Cooper-Wright, M. (2015) Design Research From Interview to Insight: Part Two, Synthesising Insight. [On­line] Medium. Available at: https://medium.com/de­sign-research-methods/design-research-from-interview-to-insight-f6957b37c698 [Accessed 11st July 2018]. Design Council (n.d.) The Design Process: What is the Double Diamond? [Online]. Avail­able at: https://www.designcouncil.org.uk/news-opinion/design-pro­cess-what-double-diamond [Accessed 9th July 2018]. Google (n.d.) Sketch. [Online]. Available at: https://designsprintkit.withgoogle.com/methods/sketch/ [Accessed 12th July 2018]. https://designsprintkit.withgoogle.com/methods/sketch/crazy-8s/ [Accessed 12th July 2018]. Gray, D. (2010) Impact & Effort Matrix. [Online] Gamestorming. Available at: http://gamestorming.com/impact-effort-matrix-2/ [Accessed 13th July 2018]. Gray, D. (2017) Updated Empathy Map Canvas. [Online] Medium. Available at: https://medium.com/the-xplane-collection/updated-empathy-map-canvas-46df22df3c8a [Accessed 9th July 2018]. https://medium.com/@InVisionApp/how-to-quickly-create-a-powerful-survey-5594ce0b3490 [Accessed 9th july 2018]. TheRosePedals (2013) Ideo, an innovative design company — 60 Minutes. Available at: https://www.interaction-design.org/literature/article/essential-design-thinking-videos-and-methods [Accessed 7th July 2018]. Tollady, B. (2016) Under the influence: Dark patterns and the power of persuasive design. [Online] UX Mastery. Available at: https://uxmastery.com/dark-patterns-and-the-power-of-persuasive-design/ [Accessed 11th July 2018]. Experience Design: a new discipline? was originally published in UX Collective on Medium, where people are continuing the conversation by highlighting and responding to this story. How Big Are Your Creative Dreams?